Repair OCI Elite E36 and E48 barbecue grill models with brand new U burner installation. In the images below we repair a barbeque grill by Outdoor Concepts, Inc by installing a new U burner which comes with a back mounting bracket and elongated orifice to provide additional support. New U burner installed in e36 and e48 OCI barbecue grill models. Although the u burner can be installed without the new orifice and back mounting bracket we install the burner with these items because this makes the installed burner tightly mounted and unable to be moved in any direction once installed. The orifice is exactly the same as the size and threading that comes already installed in the OCI barbecues but is about twice as long as a normal orifice so the burner has extra support. Behind the burner we use a u-clamp “L” bracket that will sit directly on top of the existing burner support ledge. 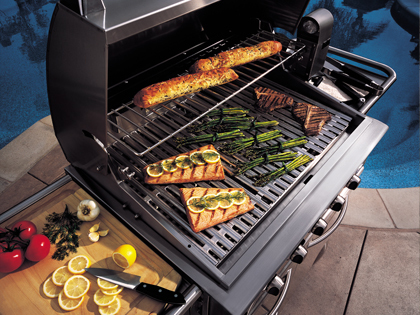 Although it is work to place holes into the back wall of a grill that has such high-quality and thick stainless steel, with the correct tools this is not very difficult. As shown in this instructional video, we score the wall location with a marker and then use a steel hole drill-bit which is designed to make large and larger holes even though we only need a hole about 3/16″. We use the pyramid-like hole drill-bit because the tip cuts through the 304 type 18 gauge stainless steel without spending a lot of time doing so. When I first did this with self-tapping screws as we easily use through galvanized steel, I lost a Lot of time and Still dip not have the hole I wanted. 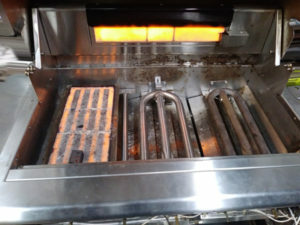 Although the burner installed in the OCI Elite gas bbq grill models is a great fit, the support clips are not the same so we use the back support bracket for additional stability on the back wall whereas the front support is the longer orifice added to the tip of the control valve as shown in the video directions. What we do not generally see inside a gas grill control panel is the control valves attached to the gas manifold pipe and the orifice attached to the valve where the burner air shutter slides over the orifice. When we remove and install the orifice, we do not need to expose all these inner workings of the inside of the control panel because we can simply reach through the inner firewall to unscrew the orifice and thread on a new orifice. 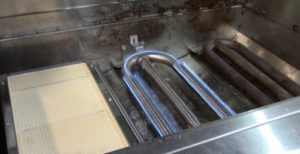 The new, longer gas orifice will be about twice as long as the original and slides into the air shutter of the new U burner as shown in the video installation instructions and the image shown here. New OCI grill burner installed in bbq. Once the new U burner is installed the setting is simple and fits inside the space created by the ignition cross-over tube brackets. If you have an OCI barbeque grill model you already know these crossover electrodes do not always ignite quickly because fuel has to flow into the crossover tube to reach the electronic sparking electrode. New U burners fit without changing or adjusting width of ignitor electrode cross over bracket. In this image of the infrared burners glowing you can also see we have replaced the OCI smoker pipe burner. 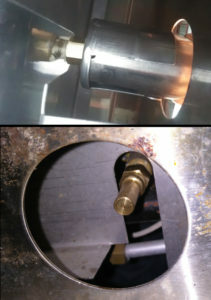 We replaced the ignition electrode so the smoker burner ignites quickly and easily when we installed the smoker burner. These OCI U burners are simple to install safely and Outdoor Concepts, Inc made some of the best grills of their time so these are absolutely definitely barbecue grills are worth repairing and continuing to use. Previous post: Repair Dynasty Jenn Air BBQ Grill Burners With Cast Iron or Stainless Steel H Burner.